E566: Andy Faulkner on Perspective, Purpose and Why Animals Need You The Most. Today it’s my absolute pleasure to share my chat with one of the true legends of the Sydney animal rights street activism scene. This gentleman is beloved and I’m sure you’ll understand why once you get to hear him speak. His relentless focus, genuine passion and infectious positivity is unequalled. Andy Faulkner is exactly the man I’d want fighting for me if I was one of the billions of animals suffering needlessly in a man made HELL. If you can from time to time feel a little disheartened or overwhelmed at the extend of animal exploitation globally, then todays show is for you! It’s a HUGE injection of compassion, love and energy… and was so much fun! Let’s explore Perspective, Purpose and Why Animals Need You The Most with Andy Faulkner. What Andy would tell his 16 year old (meat head!) self now. What Andy does when he feels overwhelmed by the scale of animal exploitation. Andy’s first form of activism and what / who prompted it. The most challenging moment of Andy’s activism journey. Andy share’s a little more about his approach with children. Why do kids deserve to know where their food comes from and should the conversation be handled differently than those we have with adults? I ask Andy about his videos with a different approach to activism recently. More comedy focused. What’s the strategy there? WOW! What an absolute superstar right? If you know Andy, I’m sure you were laughing along with us in parts of that chat. If you’re yet to meet Andy I recommend connecting with him via Andy Faulkner on Facebook and his site http://www.savepoppy.com which is home to an awesome collection of all the videos you need to watch to learn about the horrific impact of animal agriculture globally. The more kid friendly site Andy mentioned is www.loveallanimals.com.au. When I hunt it down I’ll also link to Andy’s poem. 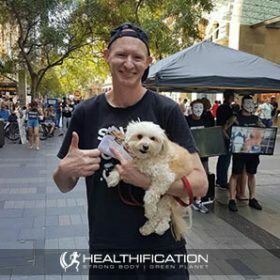 Do you know after that chat – which could have gone for twice as long yet we were keen to get out on the street spreading vegan love and truth bombs – I had my best ever afternoon of outreach on behalf of Anonymous for the Voiceless. I had such a diverse range of conversations with such a diverse range of people. And the beautiful south american traveller who is already vegan and burst into tears as she tried to explain the death threats activists in her country face. Even the gent, who told me he spent years in jail for throwing a kitten out of a window and the group of teenage boys who I couldn’t let go as they taunted “but bacon tastes so good” as they strolled past. Every single conversation was positive. It’s amazing how when you bring compassion, calm, zero judgement and yet a super genuine passion and purpose to an interaction it’s generally reflected back at you. I’m no expert however time spent with people like Andy Faulkner helps me get much better and I’m absolutely committed to having these sometimes tough conversations because animals need me and animals need YOU the most.